Middle-East electronic security market has been categorized into three segments - Video Surveillance (Analog Surveillance, IP Surveillance Systems and Software), Access Control (Card Reader, Biometric, and Others) and Intrusion Detection Systems. 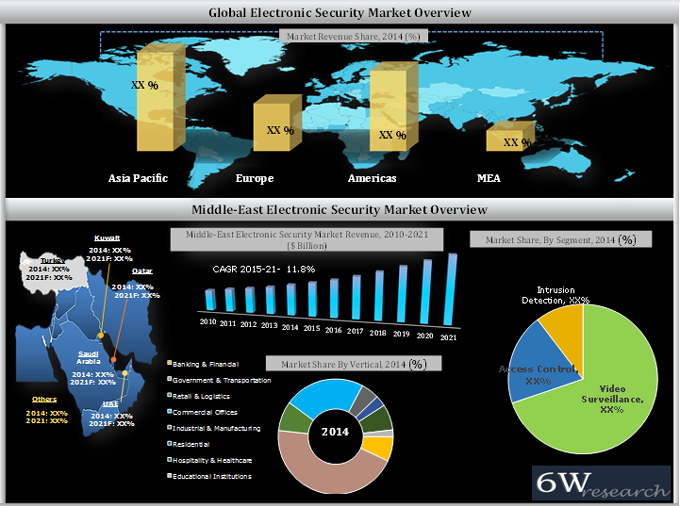 According to 6Wresearch, Middle-East electronic security market is projected to grow at a CAGR of 11.8% during 2015-21. In Middle-East electronic security market, video surveillance segment grew aggressively and expected to grow further over the next six years, where IP/ network video surveillance sub-segment contributed majorly. Growing construction market, rising IT infrastructure, increasing security spending coupled with growing security concerns have driven the electronic security systems market in Middle-East. Amongst all verticals, government & transportation sector acquired lion share in overall market revenue. Over the next six years, verticals primarily, government & transportation and commercial offices are anticipated to grow with relatively higher CAGR from 2015 to 2021. The report thoroughly covers electronic security market by types, components, verticals and countries. The report provides an unbiased and detailed analysis of the on-going trends, opportunities/ high growth areas, market drivers which would help the stakeholders to decide and align their market strategies according to the current and future market dynamics. 18.2 Bosch Security Systems, Inc.
18.4 Lenel Systems International Inc.
18.6 ID Teck Co. Ltd.
18.10 Samsung Techwin Co. Ltd.
18.11 Hangzhou Hikvision Digital Co. Ltd.
Middle-East is one of the rapid growing regions globally. On account of growing construction market, Middle-East is witnessing sharp growth in deployment of enhanced electronic security systems. Electronic security systems consist of video surveillance systems, access control systems and intrusion detection systems. Video surveillance systems accounted for majority of installations in vertical ranging from government & transportation, banking & financial, commercial offices, retail & logistics, etc. Some of the major players in Middle-East electronic security market include- Axis Communications, Bosch Security Systems, Lenel Systems, Honeywell, Pelco by Schneider Electric, Samsung Techwin, Hikvision, HID Corporation, IDTECK, Siemens, and Fingertec.